I’ve put together a little arm workout circuit you can do at home. So even if you don’t have a gym membership or access to a gym, there are no excuses. When I started working out I always found it a bit hard to train my arms; but as soon as you get just a little bit stronger it’s so much fun! This circuit is mainly focused on triceps (the back of your arms) which is the area one really wants to tone up, right? This circuit consists of 5 different exercises, and because we are doing these at home you might not have very big weights. 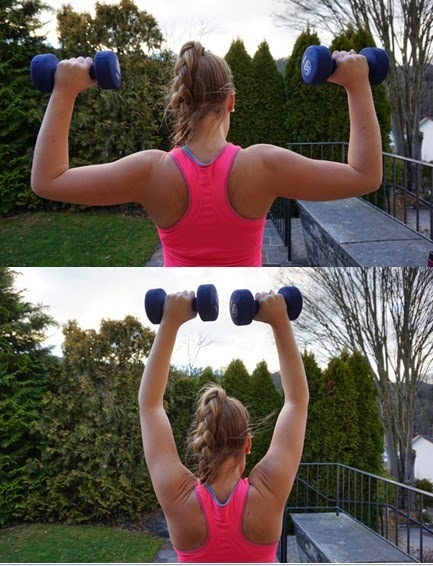 If you have a set of dumbbells – great! If you don’t – no worries! You can use a big water bottle or anything else you could find at home that weighs a little something. First up are Bicep Curls. One arm at the time, do your repetitions until failure. This means you keep doing reps until you can’t do another. You can use a chair, bench, sofa whatever you can find. If you lift your toes up and only balance on your heels you will engage your core too. Again do this one until failure. If you’ve never done these before they can be hard so feel free to do them on your knees. Make sure your body is straight (no butts in the air) and your elbows stay by your side, as you lower your body down. Again do these to failure! Make sure you don’t move too fast, but rather in a controlled manner up and down. Again, go until you can’t do another rep! Find something in your house that weights a little something and put it behind your head. Then move your arms up, extend your triceps – do you feel the burn?! Again go until you can’t go anymore. Try doing this circuit 3-4 times with just small breaks between each exercise. Let me know what you think!